The best-known stories of the West tend to be tales about bands of brothers. As I’ve pointed out, the real-life Lovewell brothers did roam the West together for about ten years, in their quest for gold and prime real estate. An entire genre of cinema is devoted to showing how the Earp and Masterson brothers upheld the law together, while the Clanton, McLaury, James and Dalton brothers broke it together. A few decades ago filmmakers decided to underline the point by having a well known coalition of outlaw brothers portrayed by sets of actual brothers. Stacy Keach and his brother James were Frank and Jesse James, three Carradine brothers played the Youngers, Nicholas and Christopher Guest portrayed Bob and Charley Ford, and Dennis and Randy Quaid played the less notorious Miller brothers. As the film ably demonstrates, family members often share physical characteristics, but not always. James and Stacy Keach look like brothers, as do the Carradines, while Dennis and Randy don’t even look like distant cousins. There’s also something to be said about the Keaches playing Jesse and Frank James, brothers who happened to look nothing alike in real life. Otherwise, the film sticks fairly close to facts, providing a lesson in why Hollywood often fiddles with them. “The Long Riders” disappointed some critics by refusing to hew to a classic three-act structure, choosing instead to mirror real life, a messy affair composed of any number of random acts. What eventually jogged my memory about “The Long Riders” was that picture of Stofer family members paying their respects to the late Jacob G. Stofer at Scandia in 1924. Glancing at it I saw only funny robes which at first suggested the Supreme Court, and then a church choir taking a break from practice. After buckling down to business, a funeral gathering seemed the obvious guess, and was the one I settled on. The family has returned from a funeral and assembled on the lawn for a group photo. Then, as I took a closer look, it surprised me to note how little the people resembled each other, despite the fact that they were all closely related. Or were they? 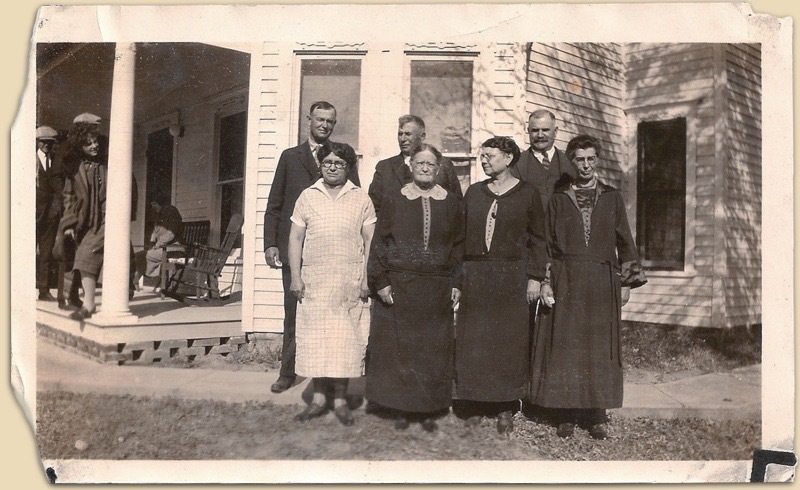 When I showed the picture to my wife, she pointed to the woman at the left edge of the front row and asked, “Is she the housekeeper?” It was something uncharacteristically un-PC for my wife to say, but the same thought had occurred to me. Besides looking nothing like the others, she's the only one not dressed in black, and thus evidently didn’t expect to be seated among relatives at Mr. Stofer’s funeral. And yet, the lady in the bright dress obviously does belong in the picture, because … well, she’s there. So the question becomes, what is she doing there? And if she's not Emma, where is Emma? If the occasion for the picture is what I assumed it to be, then the widowed Nancy Stofer should be surrounded by her six surviving children, Ben, Bursy, Jake, Mary, Rose and Emma, all dressed appropriately for a funeral. I should come clean on another point I didn’t mention before. Years ago when I was looking into the story of Greta Granstedt I happened upon a very tiny picture that was said to be a likeness of Greta's mother, a well-dressed, dignified woman with a round face and what I assumed to be light brown hair, someone I didn’t recognize among the mourners. Perhaps she's hiding in plain sight. As I’ve pointed out before, another scene is playing out at the left margin of the picture where a seated woman seems to have been overcome with grief, while a teenage girl in very tony attire watches the photo-op with evident amusement. I wondered if the distraught woman could be Emma, attempting to pull herself together while another member of the Granstedt entourage stands in for her during a warm-up photograph. No. Despite all the silly theories I can think of, Emma is exactly where she should be, standing beside her mother, but having slipped out of her gloomy mourning weeds as quickly as possible. * We know that the death of her father did bring Emma Granstedt to Scandia, because newspapers reported on her many visits with friends throughout the region in the days following Jacob Stofer's funeral. Perhaps, like many people getting together with old acquaintances, she decided to color her hair for the occasion. It would be one of her last few trips back to Kansas. After the death of Nancy Stofer five years later, Theodore Granstedt, still limping from injuries received in the sinking of the San Juan, a maritime tragedy that claimed the life of Emma and nearly 70 fellow passengers, made his own final sad journey to Scandia to attend the funeral of his mother-in-law. Thanks to clippings from a family scrapbook shared recently by Stofer descendants, we know that her relatives back in Kansas faithfully followed Greta Granstedt’s adventures, her marriages, divorces, annulments, her adoption of a son, even the occasional opening of a film or play in which the perennial bit-player was cast in an important role. Her younger sister Vivian had to be content to live in Greta’s shadow, generating little news herself, except when she was severely hurt in a car crash at 17 after being driven home from Greta’s place. Tossed from the car, Vivian was hurled against a stone wall, fracturing her skull from front to back. She pulled through, seems to have married twice, divorced at least once, and lived to be 93 or 94. Since this episode of the blog started out to be about real-life brothers playing brothers who either looked alike or didn’t, I couldn’t post it before hunting down a photo of Vivian. Googling “Greta Granstedt” immediately yields at least a hundred images on the first page. 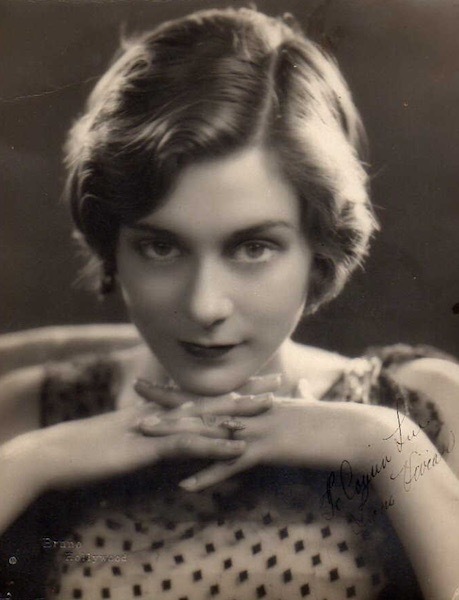 I found exactly one of Vivian Granstedt, but it proves that these sisters, who both lived in Hollywood in the 1930’s, should have played themselves in the movie of their life.